Opening their ears to the community to learn its needs is first and foremost on the minds of two new, dynamic Alliance staff members in Cleveland. And, though new to the Alliance, Crystal M.C. Davis and Destinee Henton are anything but new when it comes to connecting with communities. Davis has a background in leading professional government affairs, and Destinee Henton has experience with community organizing. Both are already putting their skills to work in involving Ohioans in conversations — and action — on behalf of Lake Erie and clean drinking water. Alliance policy director Crystal M.C. Davis. For Davis, a native of Akron, Ohio, assuming the post of policy director in May was a homecoming of sorts. “This is an opportunity for me to come home and work on issues that affect my family and my community,” she says. Davis brings extensive government relations experience to the Alliance, most recently serving as federal relations director for Kent State University’s Office of Government & Community Relations. 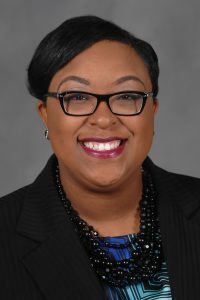 She also previously worked for the Ohio House of Representatives, the Ohio Legislative Black Caucus and the Ohio Department of Natural Resources. Davis is most excited about reaching out to people who aren’t already environmentalists, especially minorities — which is key in a city with a minority majority. 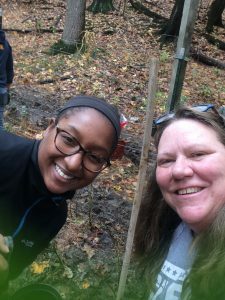 Destinee Henton, Alliance community outreach coordinator, joined Adopt-a-Beach manager Jamie Cross at a Cleveland restoration event this fall. “The end goal is a clean Lake Erie. How are these conversations going to aid us in creating a clean Lake Erie? What do Clevelanders want to see from Lake Erie? The answers will help us create our goals,” she says. No stranger to Cleveland, Henton comes to the Alliance from Ohio City Incorporated where, as community outreach coordinator, she worked with the historic Ohio City neighborhood on Cleveland’s west side to address civic issues and lead community-based projects. 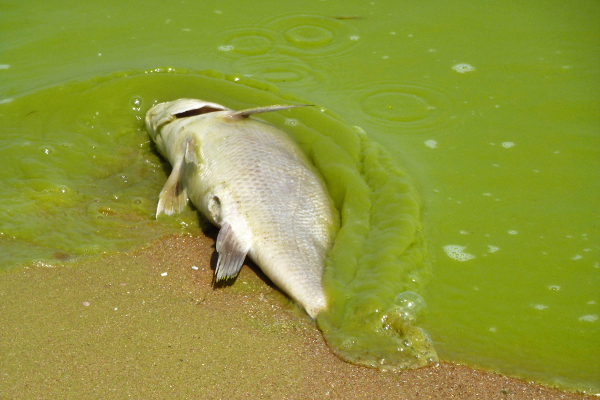 In the wake of the 2014 water crisis in Toledo, Ohio, where a toxic algal bloom shut down that city’s water supply for nearly three days, Henton says people have been paying more attention to water and water quality. But it’s been inconsistent. Henton says she and Davis are looking for ways to embed talk of the Great Lakes and Lake Erie in the continuing local conversation so it becomes automatic for Clevelanders and Northern Ohioans to factor them in when weighing possible impacts. Greater awareness of Lake Erie and its importance to the people of Cleveland can also help the community with how it views and treats its members in terms of social and environmental justice, she says. Fortunately, there are plenty of local groups and structures ready to tap into in Cleveland, so she and Davis can build from there. Davis invites people to email her about ideas for getting involved, whether it be crowd-building for a community conversation or helping find space for a public educational briefing. She warns she’s not your typical environmentalist. Though she cares deeply about the environment, she doesn’t hike, canoe or kayak. “Anything outside, I don’t do it,” Davis laughs. But that also has its benefits. 11 million people drink Lake Erie water. But it’s at risk. Learn how you can help.